As I write this, it’s 23.8 degrees atop 6,288-foot Mount Washington—a balmy morning compared to Saturday, when the summit clocked in with a high of 6 degrees and a low of minus-2. Month to date, the Mount Washington Observatory has received just over 20 inches of snowfall, with more coming down today. As of last night, six inches of snow and ice blanketed the ground. There’s no doubt that winter is here for the season, its arrival boosted by the continuing effects of last week’s “Bering Sea Bomb,” a super-storm that drove frigid polar into the central and eastern U.S. The chill is forecast to deepen further over the coming days, with the mercury forecast to plunge into the single digits across the higher summits of New Hampshire. Ski on! 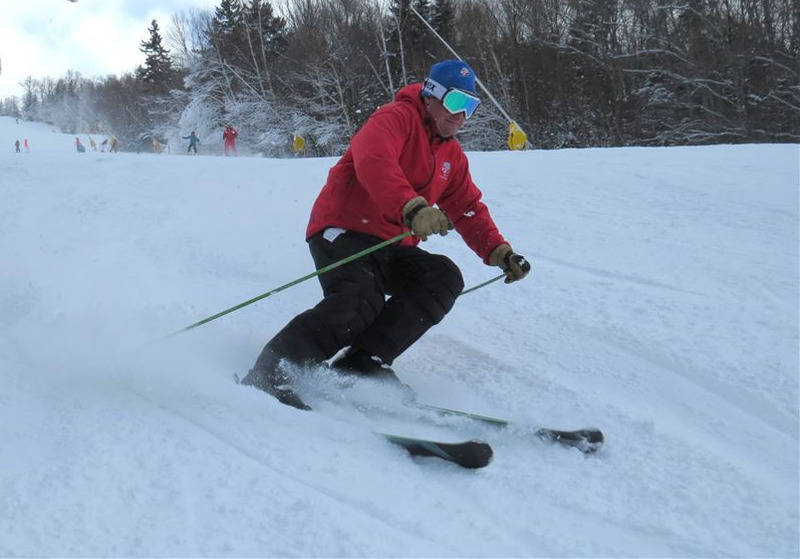 Hitting the slopes at Bretton Woods on Monday, November 17. Photo courtesy of Bretton Woods. The NERFC Snow Depth Map for New England and New York, which is updated daily by NOAA and the National Weather Service. The great collection of White Mountain web cams, most of which are operated by the Mount Washington Observatory (which also recently launched a redesigned—and excellent—new web site). AMC’s Backcountry Weather and Trail Conditions, which provide the latest info for the areas around its lodges and backcountry huts. The daily Avalanche Advisory for Tuckerman and Huntington Ravines, which will soon be updated daily by The Mount Washington Avalanche Center. A must-read for backcountry skiers, climbers, and hikers tackling Mount Washington in winter. Let the winter fun commence.